An office is more than just a place where you sit and work – it’s a place with a definite work environment. When you sit in your office, your thoughts are about work, about deadlines, meetings, and efficiency. Or at least they should be. In this blog post, we’ll take you through design hacks that will help you optimize your Garden State business so it has a good work atmosphere. That’ll lead to better concentration, increased employee morale, and ultimately greater productivity. After all, you’ve got a business to run. According to Forbes.com, productivity is 12% higher when a company’s employees are happy. Furthermore, organizations with a happy workforce outperform competitors by 20%. The Productivity Experts found that employees looking for misplaced items in the workplace cost organizations a total of $89 billion per year. 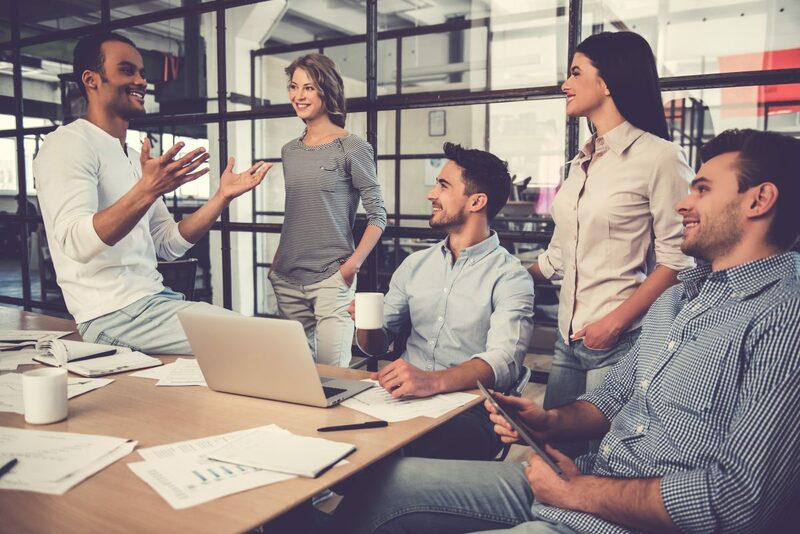 So if your employees are happy and the office space is well-organized, you’ll save a lot of money, and your workforce will be significantly more productive. The interesting thing is, it won’t take a lot to optimize your NJ office space so your employees feel happy working there. As you read the article, you’ll see how small changes will help your employees work better. Seeing the suggestion and its logical effect will perhaps help you better understand the scope of improvement here. As you can see from the statistics above, a well-organized workplace will save you money, while a cluttered office will cost you in the long run. Visual clutter is clutter that’s visible – think untidy table tops, overloaded notice boards, overflowing ‘in’ bins, and the sort. Visual clutter is worse, in a way, because it presents the same problems as ‘normal’ clutter, but since it’s visible the whole time it brings a few extra problems to the party. The biggest is that it adds anxiety. When your employees see an overflowing ‘in’ bin, they see three dozen letters and memos that need a reply, a cluttered desk is one that needed tidying yesterday, an untidy shelf is a dust-collecting nightmare they’ll never find that manual in. Investing in organizational tools – or even simply establishing a practice after a quick coaching session – will help nip this problem in the bud. It’s one that needs constant maintenance, but once a habit is formed, it’s surprisingly easy to sustain. How are the desks and chairs currently organized at your NJ office space? If your employees spend a large portion of their time at work sitting at a desk (as opposed to, say, decorating chairs, painting, or doing field work), their desk and chair need to be right posture wise. If the chair’s hard, they’ll find it uncomfortable and painful, and if it’s too soft that’ll make them uncomfortable too – not to mention drowsy. Then there’s the combined position of the desk and chair. When sitting on the chair, is the desk at the right height? A few inches too high or low can make all the difference, because your employees will find themselves continually straining (or bending), which’ll make them tired and distracted, and may even lead to chronic pain. If the work entails computer usage, the screen should be at eye level so they can sit up straight without bending or straining their neck, and the keyboard should be positioned so their forearm and hands are parallel with the ground when using it. Incorrect positioning can cause straining, aches, sprains, and other problems. Lack of fresh air can cost your business. According to OSHA, poor air quality in offices costs employers a total of $15 billion every year. This may be in the form of reduced work efficiency, or sick leave. If you live in an area with a low pollution rate, having large windows that are kept open may be sufficient. However, for those living in large cities or areas with high pollution, that’d in fact make things worse. A good start would be to install good quality air filters, and have them cleaned and/or replaced regularly. Another nifty little trick is to have a lot of indoor plants in the office. Plants like peace lily, golden pothos and snake plant will not only improve the air quality, but be a cheap, low-maintenance piece of evergreen decoration. Plants have the added benefit of softening the look of any place, so your office will look lively and welcoming. “As soon as I step into the office, I just give up. I feel drowsy and depressed,” says Joanna, an accountant based in NJ. Her office space is, in her own words, “grey, with grey lighting”. When you hear the word “grey”, what are your feelings? Are they of excitement, optimism, productivity? Of a day to look forward to? Most would say no. Don’t misunderstand me – this isn’t about the color grey itself. An office with grey desks and grey walls can provoke the feelings listed above. It’s about feeling grey. Your office space needs to be bright and well-lit. Not only will that ward off fatigue and boredom, but also headaches, eyestrain, and other problems. If your employees need to stare into a screen while working, this is especially important. Looking at a bright screen in poor light can cause serious problems, which would be an injury sustained while at work – for which you would be liable. Refreshment isn’t a waste of money! Since your employees are at the office for hours every weekday, working continuously, having refreshment on the premises is a good idea. Water is a bare necessity, and coffee (or tea) will help your employees stay awake and alert. However, also consider having some food items. Healthy snacks such as fruits, nuts and yogurt will not only make your employees happier, but it’ll show them that you care – which will boost their morale significantly. Bringing lunch from home is a hassle, and buying snacks everyday can get expensive. So if you serve fresh food on the premises – even if it’s just a light snack – your employees will be grateful for it. Bear in mind, though, that unhealthy snacks aren’t a good idea. While your employees may enjoy soft drinks, fried snacks and pre-packaged food, they aren’t the best for health or energy levels, so you wouldn’t be doing anyone a favor. Having the right temperature is very important if you want your NJ office space to have a good work environment. If you’ve had to live with a roommate or partner that turned the thermostat way up (or down), you’ll know just how important. If the office temperature isn’t comfortable, your staff will be distracted – to put it mildly. The optimum temperature range for productivity is believed to be 70-73 degrees. Some sources claim that women generally have a lower metabolic rate, and so need a slightly higher temperature. Aside from causing discomfort and lack of focus, the wrong temperature can cause colds, sweating, drowsiness, irritability and tiredness. Does the office smell of something? Of paint or rubber? Maybe the butcher or carpenter across the road make their presence felt through the windows? Odors can be distracting, and in certain cases even injurious to your health. The ‘fresh paint’ smell, for instance, is because of VOCs (volatile organic chemicals) in the air – which can cause a number of problems both in the short and long term. Other smells such as turpentine, wood polish or noxious chemicals are similarly injurious, and can induce migraines and nausea. Ideally, an office should smell neutral. So you should try to keep unpleasant smells out. If you want to go one step further (because you know your employees and your situation best), you can try room fresheners or diffusers. Scents like pine, cinnamon and citrus are good for the workplace – they increase alertness, focus, and generally make people feel better. A quiet workplace is less distracting – this doesn’t need much explaining. This might be something to keep in mind while scouting in NJ for office space – because a busy street will naturally be a noisy one, and once you’ve got an office in a noisy place there isn’t much you can do. There are, however, a few things you can do to minimize noise levels inside. If construction work is still going on, you can opt for windows that keep out the noise. If you’re past that point, heavy curtains might help. If all else fails, you can arrange background music. You might think that’d be just as disturbing, but since music isn’t discordant, people don’t usually find it disturbing or distracting. White noise is another excellent idea – whether you go for a white noise machine in each cubicle, or just fans that make themselves heard. Yet another option – which would put some control in the hands of your employees – would be to give them noise cancellation headphones. This may not be feasible for companies with a large workforce. These were eight tips that’ll help you optimize your NJ office space for maximum productivity. Remember that productivity isn’t solely about output or turnaround – it includes a variety of things, such as creativity, problem-solving abilities, time-efficiency, and much more. Also, productivity is a long-term goal. All the factors above will give you a better workforce, but don’t expect it to happen tomorrow. If you’re looking for an office space in NJ, contact Blau & Berg today. Headquartered in Short Hills, New Jersey, Blau & Berg is an independent, full- service commercial real estate brokerage firm providing services in the industrial, retail and office spaces.